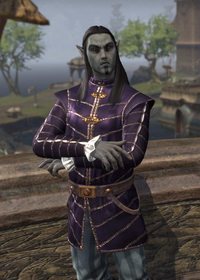 Folms Telvanni is a Dunmer noble of House Telvanni who can be found in the Canton of St. Delyn the Wise in Vivec City. He's not very happy about the ban on slavery. "I don't know why Lord Vivec ever agreed to this. No slaves? In a Dark Elf city? Who ever heard of something so outlandish!" "Ugh! These cantons will never be finished with freed laborers. Perhaps if I complained to Lord Vivec, he could make an exception for us. These delays really can't be tolerated." "This banning of slavery is so irksome. Why must I suffer through the slowness of these free workers?" "Everyone is working faster now that the moonlet is stable again, but the number of breaks they take! Ugh! If I had a contingent of tireless slaves, we'd be done by now." "Perhaps one day there will be slaves in the city again, and everything will be as it should. Until then, I need to keep a keen eye on these so-called wage-workers." "You want something done fast? You want something done right? You get slaves to do it! You have to watch them like hawks and beat them every now and again, but they're much more reliable than these wage-workers." This page was last modified on 24 February 2019, at 00:04.